Ahhh the Snickerdoodle. Some foods have a name so cute you can’t help but love them. 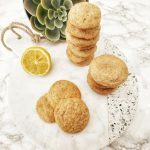 These adorable little dears have just the right amount of chewiness- they aren’t meant to be a crunchy cookie, but more like a soft sugar cookie with an absolutely amazing sugar and spice coating. Why do snickerdoodles use cream of tartar? Typically the tangy flavor in a snickerdoodle comes from the cream of tartar. It also helps it develop the right amount of “chew” – the yummy gummyness that make these cookies so delicious. I’ve come up with a way to lose the cream of tartar. Let’s be honest… have you ever used this white powder for anything else? …and when you want a snickerdoodle, did you really feel like running to the store for a silly little box of cream of tartar first? ‘aint nobody got time for that. Lemon juice helps add the tangy flavor back into the cookies, and brown sugar gives it the chew we are all after. I like to use fresh lemon juice… but use what you have. 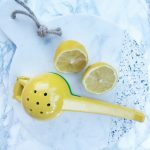 My Citrus Press gets well used! It’s diecast aluminum design makes for a super strong press- and it’s two in one! 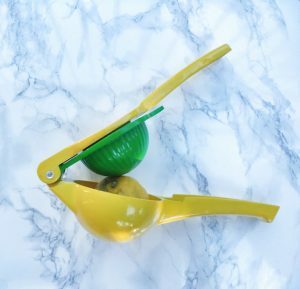 Not only can you squeeze lemons, but the little green section is for limes! (Hello there, delicious cocktails and guacamole!). The brown sugar is the second part to our secret to avoiding the tartar… it’s flavor is richer, and it leaves behind a more caramel-like texture than it’s white friend. How about some Eggnog Spice Syrup, for a fancy DIY latte? A latte at home is easy to make (recipe here), has lower calories than a drive through’s version… and you don’t even need to leave your kitchen! We also love this delicious blend in pancakes, muffins, cheesecakes, creme brule, waffles and more! Ice cream your thing? At the end of every winter, I horde a couple bottles of eggnog spice mix to keep me alive through summer. Eggnog spice sprinkled on vanilla ice cream. It sounds simple, and perhaps a bit ridiculous… but I dare you to try it. Sorry about your diet. Now, the classic cinnamon coating is good… real good. 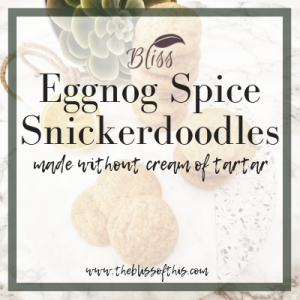 This recipe can easily be made with cinnamon instead of the eggnog spice mix if you aren’t into the eggnog idea, but I encourage you to give a bottle of this mix a try! (of course, as with all Epicure’s products, you have 30 days to get your $ back if you find it isn’t absolutely amazing). Both options will leave your home smelling amazing as they bake! I try be the nice Mom that bakes with her kids. I was going to keep it real, remember?! My real is that sometimes the kitchen is just too crowded, or I actually can’t have teeny fingerprints in my dessert… or, sometimes this mamma just needs to clear her head and bake while Netflix does some babysitting. It’s just how real life goes. THIS, is actually a recipe where I completely appreciate my kid’s enthusiasm to help. My son’s eyes lit up when he realized it was “snicker-noodles” in the mixer… my older daughter ran to scrub her hands… and the youngest grabbed the stool to stand in the middle of it all. They were quickly recruited to rolling. I like to leave little cookie sized dough blobs for them to roll neatly, and toss into the sugar bowl. The youngest makes an attempt at the sugar bowl… with a spoon as her tool of choice. Her position as supervisor is terminated. The oldest knows that dough on the ground should not be baked in with the batch … so decides to drop a generous blob of dough on the kitchen floor. Though firing was discussed, we decided the double batch left way too much dough to be rolled to lay off the lead roller. She’s on probation. Payment was cut in cookie currency… let’s just say they had no issue finishing dinner with a sweet little bribe for dessert. There was far less rolling for me to do, and they were so proud of their efforts! 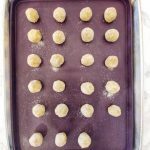 Epicure’s Silicone Bake & Roll creates a nice thick, even layer on your cookie sheets. It’s made with flexible 100% food grade silicone, to create a non-stick layer for your baked treats, roasted veggies, meats, and more. It has a beauty of a raised edge to catch all the drippings from your chicken wings to your apple pies. The best part is: it’s dishwasher safe! No more scrubbing cookie sheets! Just take the silicone baking mat off, and pop it in the oven. No more cookies burning, no more wings sticking, and no more pies dripping. Often I have a customer order one, and a few weeks later call in a panic begging for another bake & roll mat for the rest of her cookie sheets! Are you already a proud owner? Let me know in the comments below! 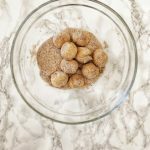 May I hook you up with even more delicious recipes and ideas? Please feel free to sign up for emails either on the form below or to the right. We all get enough spam, don’t worry… I won’t be obnoxious. 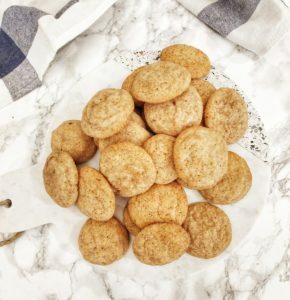 Finally, a snickerdoodle recipe that doesn't need cream of tartar. 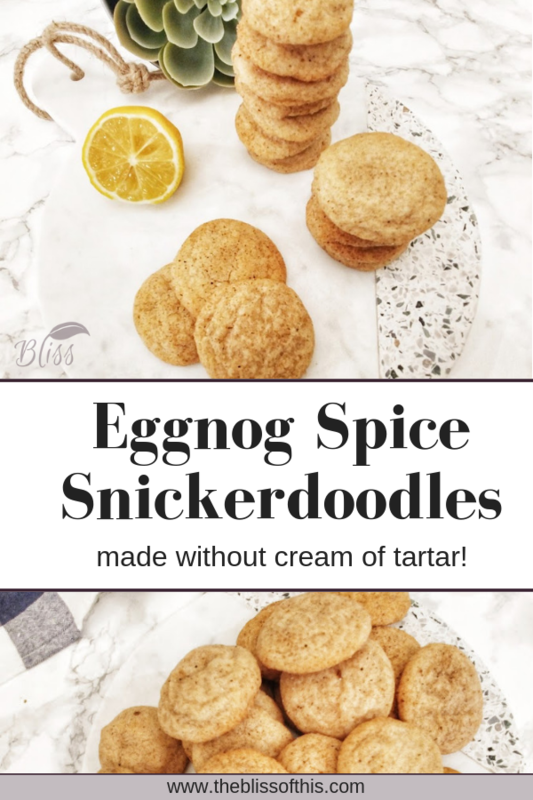 This recipe can be make with Epicure's delicious eggnog spice, or an equal amount of cinnamon can be substituted. In a large bowl, cream together butter, white sugar, brown sugar, and lemon juice. Roll dough by hand into 1 inch balls. Toss in Sugar/Spice mixture. Bake for 8-10 minutes at 375 degrees F.
A mini handheld vacuum is a wonderful addition to any home with kids… and it’s small and simple enough for kids to use themselves!